Can you believe it is 2016? One thing I love about starting a new year is reflecting on the year before. I love to look back on where we were this time last year and see the growth and changes. When I first found myself suddenly and unexpectedly homeschooling, I relied heavily on the internet for guidance. While Hoagies’, GHF, and others helped me to understand giftedness, Simple Homeschool helped me feel less overwhelmed. The fact of the matter is: there is no one way to homeschool a child. 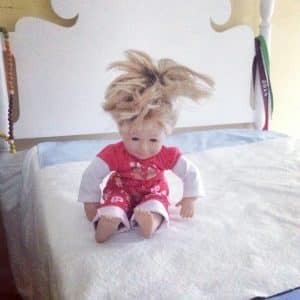 There are many different approaches and styles and you have to breathe and allow yourself to relax into a rhythm that works for your unique family. I find as much solace in Simple Homeschool’s posts today as I did back then. Every year Simple Homeschool has a Day in the Life series. 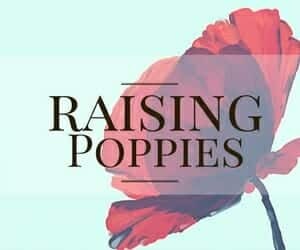 I love the series because I love to see how other folks homeschool and I never fail to learn something new from each post. At the end of the series, readers are invited to link up their own posts. It’s almost time for their 2016 series and I can’t wait! 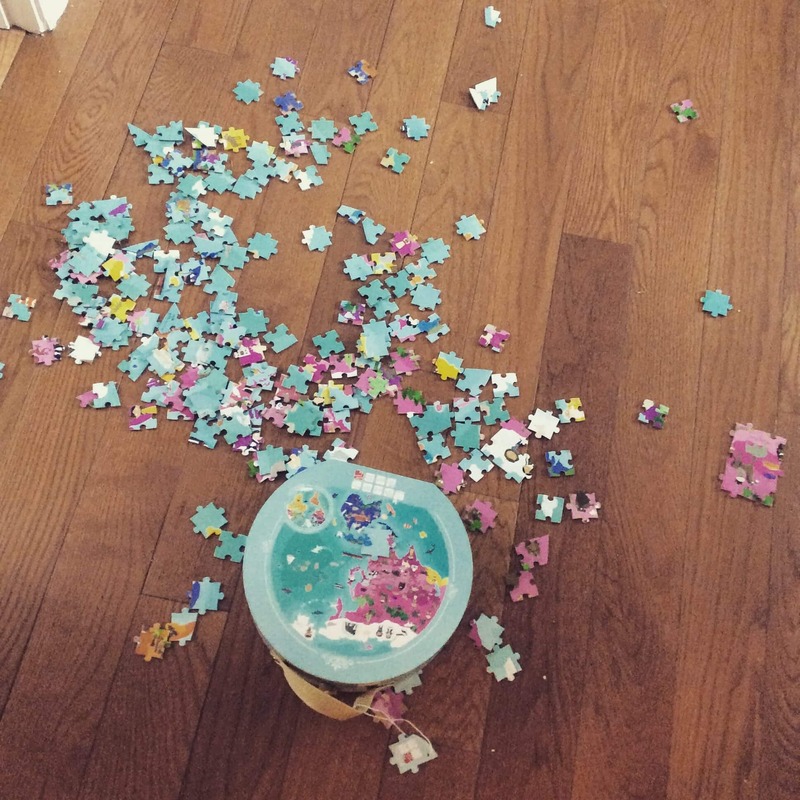 Today, I am sharing my 2015 Day in the Life post. I can’t wait to compare it to this year’s! 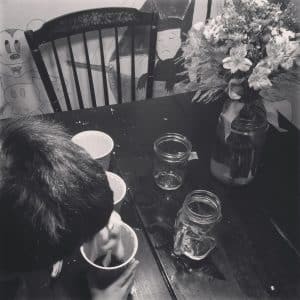 As a rookie homeschooler, I have been delighting in the recent posts over at Simple Homeschool. 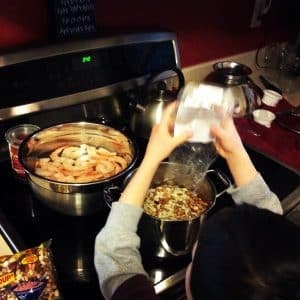 Every year, Simple Homeschool runs a series of guest posts called A Homeschool Day In The Life. Honestly, I’ll mourn the series a bit because I’ve enjoyed it that much. It’s fascinating to me to see how everyone is rocking this homeschooling gig. I’m learning so much by reading how different families approach homeschooling. Readers are invited to link up with their very own homeschool day in the life post on Monday, February 2, 2015. This post is my contribution and I’m excited to share a day in our life with you all. 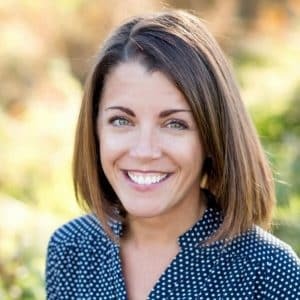 For those of you joining us from Simple Homeschool, welcome! I’m a new homeschooler, flying by the seat of my pants. If you’d like to read about how we found ourselves suddenly and unexpectedly homeschooling, you can click here. We never set out to homeschool and now I cannot imagine doing anything else. What a difference a year makes! I must preface this by stating that, lately, we don’t have a “typical” day. Our house is under construction and between that and the fact that this has not been our healthiest winter to date, life has been kinda crazy. 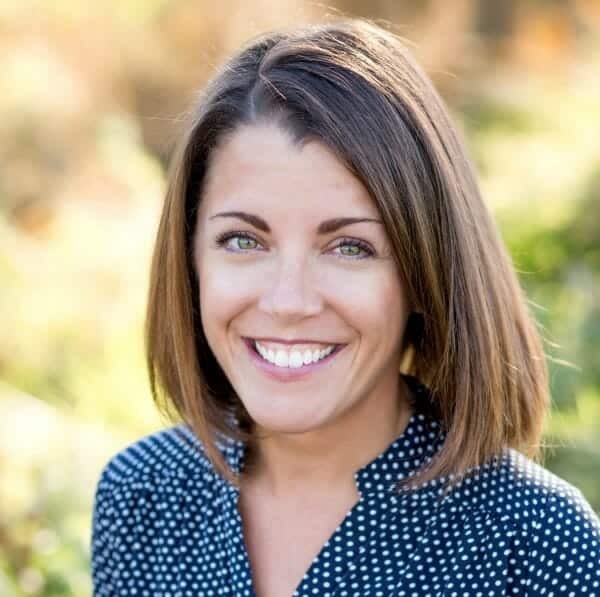 I had these grand plans of writing this post on Tuesday or Wednesday of this week, so that I could include our preschool drop offs, CrossFit, and extracurricular activities in the mix. I figured I was allowing myself plenty of time before the link up but there is a major blizzard rolling in tonight. I’m fully expecting to be off the grid for several days because that’s what usually happens around these parts. I actually think it’s fitting that the blizzard popped up to change my plans. This entire year has been an unexpected yet amazing journey! 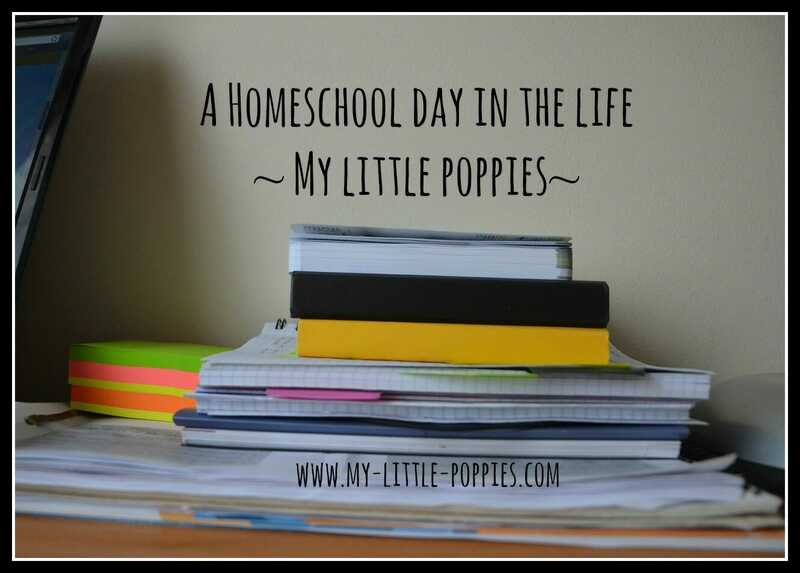 So, without further ado, I present to you A My Little Poppies Homeschool Day In The Life. Yes, I chose a weekend. Before you think I’m all homeschool-crazy, please hear me out. My husband has a pretty insane schedule with lots of nights and weekends. On the weekends that he is working, I usually plan science experiments and art projects because it keeps the kids busy and happy. In addition, my husband is off for half of this coming week (cue the choir of angels singing, “Hallelujah!! !”) and it’s been such a long stretch without him that we are planning to take those days off. So, yes, we did some homeschoolin’ on Sunday. Homeschool flexibility in all its glory, folks! 5:30 am I wake up and read in my bed. My magical coffee pot is not ready until 6:00 and the house is still warming up. I enjoy the quiet because it’s not often quiet around these parts! I’m always reading half a dozen books at once but this morning I finish rereading this one. Two thumbs up, for the second time. 6:00 am I head downstairs for my first cup of coffee. I say hello to Finnegan, our beloved Belgian, and proceed to unload the dishwasher. I set up the kids’ breakfast station by filling juice and milk pitchers. I throw in some laundry and then head to the computer. I check email and see what has been happening over at GHF, Hoagies‘, and share my favorites on my Facebook page. 7:15 am My little poppies descend the stairs in various stages of dress. Leo, 6 1/2-years-old, arrives first. I can hear him coming a mile away, that forty-one pound elephant of mine. He bursts into the kitchen with his pants on backward, barefoot, bare-chested, and talking- loudly- about the shades who reside in the Greek underworld. His shirt is slung over his shoulder and I ask him to put it on. It’s January in New England but this child of mine is never cold. Next comes my sweet T, 5 1/2-years-old, who appears in the kitchen sporting an adorable tunic and leggings complete with a hair bow. She has her beloved sidekick, Linda, tucked under her arm. I see that Linda has also changed from jammies to a fancy dress for the day. T usually manages to dress herself and Linda before the boys are even down the stairs. When 3-year-old Seuss arrives, significantly later than his older brother and sister, he is naked and his arms are filled with the clothes he has picked for the day. He makes us all giggle with a goofy dance before he starts getting dressed. 7:30 am The kids gather their bowls, cups, and utensils and select their breakfasts. They pour juice and milk with the pitchers I’ve set out for them. 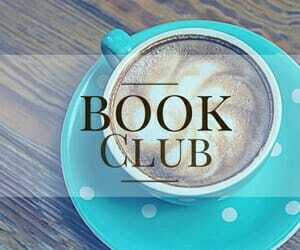 I pour my second cup of coffee and join the kids at the table for some read aloud time. This week, we are deep into Shiloh. I field lots of questions about animal cruelty and kindness. We have a great discussion. 8:00 am My little poppies put their dishes in the dishwasher and then T and Seuss head off to the playroom to play with their play kitchen. Leo wants to continue a science experiment that we were working on yesterday. I sit down and eat breakfast while he works on it. We are in the middle of a unit on measurement and we will be measuring and graphing bean seedlings in the coming weeks. After the science project is cleaned up, I share a video with the kids that I saw on GHF earlier in the morning featuring a very elaborate domino display. The kids loved it and immediately tried to recreate the video. 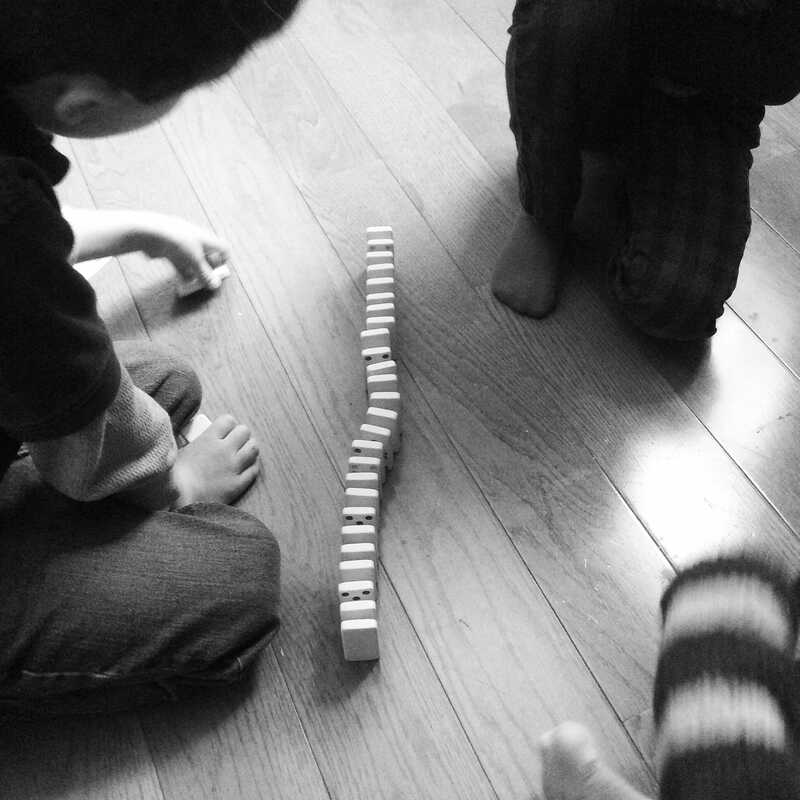 We didn’t have nearly enough dominoes as the guy in the video! 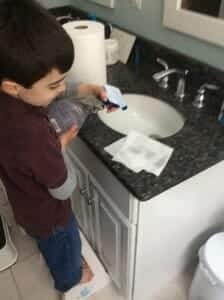 8:45 am I tidy up the kitchen and switch the laundry and then ask the kids to come upstairs with me to brush their teeth and clean a little bit upstairs. Sunday is clean sheets and clean bathrooms day around these parts. 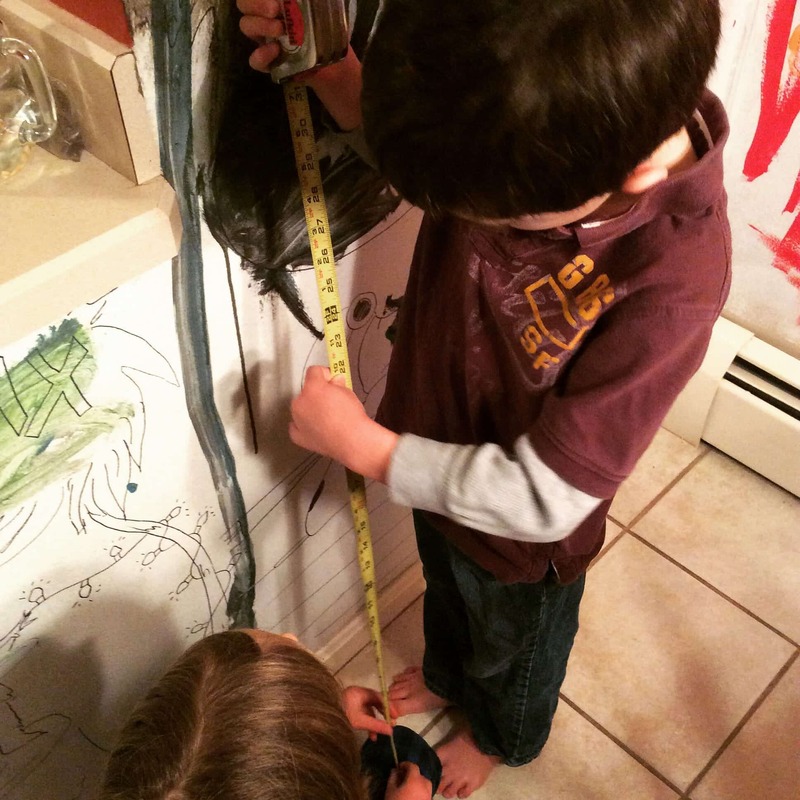 I’m thankful that I have three little helpers. Well, four if you count Linda who came upstairs with us because it was her nap time. Please note cozy jams. Linda wears more outfits in a day than I do in a week! In the past year I have seen remarkable growth in my children’s abilities to help with daily tasks around the house. I miss my babies, but this is a wonderful perk. 9:30 (ish) am I head downstairs with to toss the sheets in the wash while the kids head to the playroom to listen to an audiobook that I made to go along with one of our favorite wintry books, Snow by Uri Shulevitz. With one recent snowfall and a blizzard on the horizon, the kids’ snow-excitement is palpable. The audiobook leads to a discussion about snowfall predictions for the blizzard, which leads to more measurement. I’m a rookie homeschooler but I am constantly amazed by the learning that happens when you sit back and let it. If you are curious about the paint in our kitchen, click here. 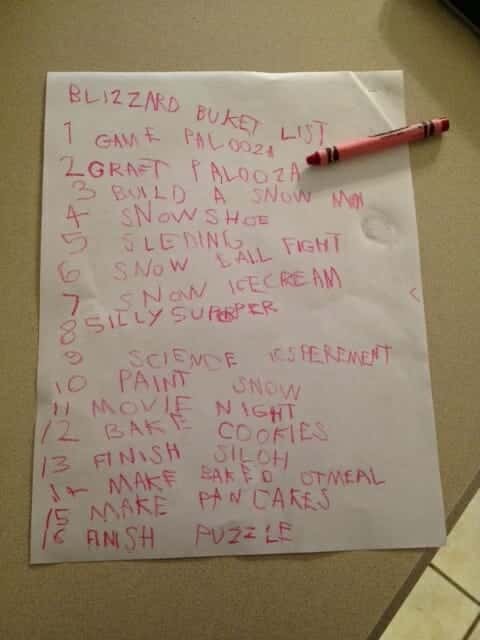 And then the kids decided to come up with a Blizzard Bucket List Challenge. We are going to see if we can complete all items before the snow stops falling. Who wants in? 10:00 am With my husband working all weekend, I’m less on top of my snow prep game than usual. We head over to our favorite farm stand to pick up a few items. The staff is familiar with my kids because we visit the farm so often. They converse with my children about the upcoming storm, weekend plans, and the whereabouts of our favorite farm kitty. Since homeschooling, I have been impressed by the socialization that happens, despite the general public’s assumption to the contrary. Leo is with me all day most days, while out in the community, and he interacts with people of all ages. 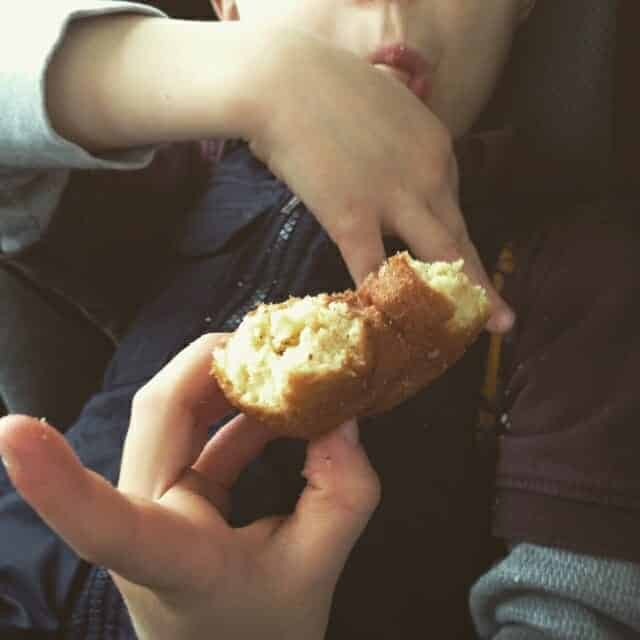 Today, he is in charge of paying for our items, including one of the kids’ faves: cider donuts. 10:45 am We usually attend mass on Sunday mornings but when my husband is working I often turn to nature instead. I feel more connected and spiritual after a walk in the woods with my children than I do flying solo at church with them. It is a gorgeous morning. 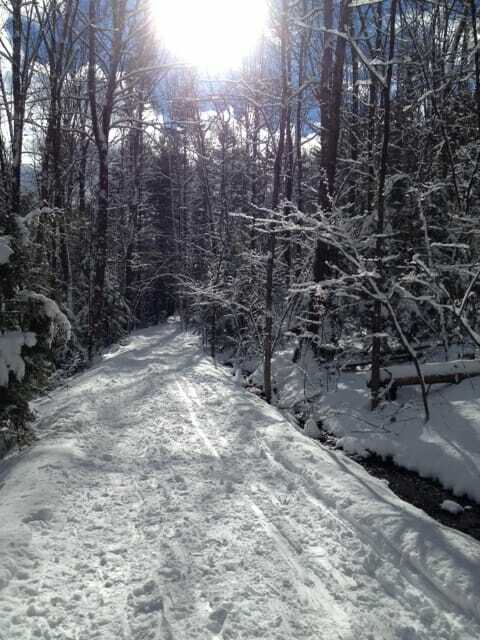 One of those beautiful, post-snowy days when the snow is still stuck to the trees. We head straight from the farm to one of our favorite hiking spots. The calm before the coming storm! Little poppies in a wigwam, because why not? We had one of those perfect, non-rushed, beautiful hikes. 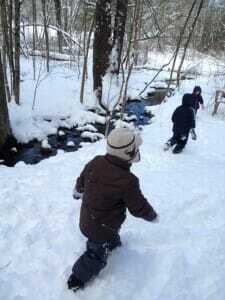 We enjoyed each other’s company and searched for animal tracks, pausing along the way to eat handfuls of snow. We stopped for a while so that the kids could play in a wigwam. T and Seuss were pretending that they were married and Leo was a ninja who kept sneaking up on them and scaring them away. This was better than church for me today. 1:30 pm We arrive home for a later-than-usual lunch. Leo volunteers to make peanut butter and jellies with clementines and carrots for the kids while I switch the laundry again. Laundry never ends around here! While I’m switching laundry, a friend stops by with some hand-me-down games for the kids- just in time for the blizzard! When the kids are done with lunch, they clear their plates. Leo and Seuss retreat to the couch in our playroom where Leo reads a stack of library books to Seuss. I fold laundry and T helps me because she’s the sweetest little soul. When we are finished, I tell the boys that it is time to head upstairs for our quiet time. 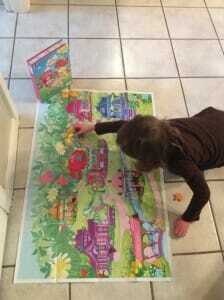 I find them working on a puzzle together. This is my favorite puzzle at the moment. A friend gave it to us for Christmas. It is a 208-piece double-sided world puzzle and it’s gorgeous! 2:00 pm Quiet time is a very special time in our house. Leo and T usually read books, listen to audiobooks, or create while Seuss naps. I use this time to shower if I’ve been to CrossFit that morning, do yoga if I haven’t, brew a cup of tension tamer tea (I drink this every afternoon, folks! ), read, or write a blog post. Today, I use my quiet time to have tea, catch up on e-mail, and read. This afternoon I also ask Leo to finish his Faith Formation assignment, as it is Sunday. He sneaks down in the middle of quiet time to ask me a question about the assignment, just in time to help me prep for dinner tonight and tomorrow night. He then goes back upstairs to read for a bit before quiet time is over. 3:00 pm Leo and T come downstairs and I ask Leo how his Faith Formation work went. He claims he lost his workbook during his quiet time so I accompany him upstairs to look for it and find it wedged between his bed and the wall. While I’m up there, I find a few already-read books to scan into his Goodreads book log. T, Leo, and I head downstairs to play some games. 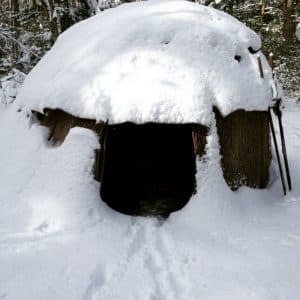 We are in the midst of an 8-week Board Game Challenge, our winter survival strategy. Today, we play Bingo, Tea Party, and the Clothespins game. In the midst of our board game palooza, Seuss wakes up and joins in the fun. 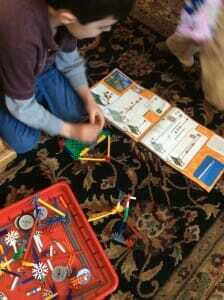 When we are done playing games, T and Seuss play with their Busy Books while Leo uses the K’Nex Levers and Pulleys kit. We have the Frozen, My Little Ponies, and Strawberry Shortcake Busy Books and T and Seuss are OBSESSED with them. This is a great little kit- hours of entertainment. 4:00 pm The laundry is finally done (for the moment). The kids and I snuggle on the couch to read a stack of library books before dinner is ready. At one point, Leo asks me what the difference between a snowstorm and a blizzard is, and so we hop on my iPad to do a little research. We then end up watching a video on BrainPop Jr about winter and then another on Mozart. I realize those two subjects aren’t related but BrainPop is like a funny little rabbit hole of learning fun. 4:45 pm The kids ask if they can get into their jammies early. I think I wore them out on that hike. They head upstairs to take a quick shower and put on their jammies. When they return, all cozy, they are so excited for the blizzard which won’t roll in until tomorrow night. Their excitement is contagious. We go over our Blizzard Bucket List again and then dance to Kenny Chesney in the kitchen. We call this Kenny Hour and it’s one of my favorite parts of our day. 5:30 pm It’s time for dinner, and Daddy is home to join us! We sit down to eat and the kids ask if they can play Beginner Dinner Games. This game and Table Topics are two of our favorite dinner activities at the moment. Tonight’s hilarity involved passing a small object from person to person while one family member has his or her eyes closed. Let’s just say my little poppies would not win at poker! There were a lot of laughs, folks. For dessert, the kids enjoy a little snow ice cream. 6:30 pm The kids help clear the dishes and T feeds Finnegan his dinner. The kids and I head upstairs while Daddy cleans up the rest of the kitchen. I oversee brushing and flossing and then we sit down to fill out our gratitude journals. Leo reads tonight’s passage from Jesus Calling, a sweet little devotional book for children that we started reading in the fall after a friend’s recommendation. A short discussion ensues and then Daddy joins us. He reads aloud to T and Seuss while I read aloud from Life of Fred with Leo because he loves to read a little Fred before bed. 7:15 pm It’s time for prayers and tuck-ins. Leo first, then T, and then Seuss- which seems like the opposite of what it should be, but it’s how we do it over here. My husband and I head downstairs. He’s got some more work to do tonight before he can relax so I cozy up on the couch with a glass of wine and some cheese and crackers, and I read until he joins me. I also use this time to jot down notes about our day in my homeschool journal. I love that our children go to bed early so that my husband and I can hang out for a while before bed. Our house is silent once more. Well, mostly silent. We can hear the pitter-patter of little feet above our heads as our little readers dip into their book baskets and return to their beds to read until they pass out. When my husband and I head upstairs at the end of the night, we turn off lights and find our children sound asleep, surrounded by books. And then I head to our room and read until I fall asleep. And that’s it, folks. 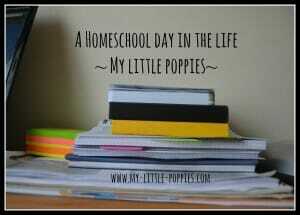 A My Little Poppies Homeschool Day in the Life. I hope you enjoyed sharing in our not-so-typical day. If you enjoyed what you’re seeing here, please feel free to follow our journey on Facebook or Twitter or Pinterest or Instagram. 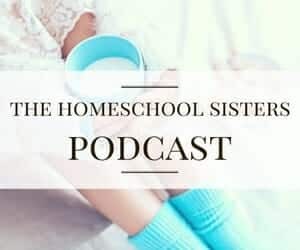 I love connecting with and learning from other homeschoolers. I’m hoping to do a Homeschool Day in the Life post next year, too, because I would love to compare the two. For those of you in the blizzard belt, I wish you warmth, fun, and safety. 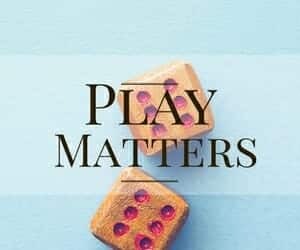 If you need some game ideas to keep you busy, click here and here, and if you are looking for ways to wear those kids out when you’re stuck indoors, click here. I might be off the grid for a few days, so I’ll see you on the other side! Love this! Our dolls get more and cuter clothes than me too! Your blog looks like it will be a great resource for me as beginner, I can’t wait to start following along. Thanks for visiting today! I love all the random ways we educate our kids! I’m jealous of your fun in the snow! I’ve really enjoyed following you on Facebook and Twitter. Thank you for sharing! What a wonderful day! So full and busy. 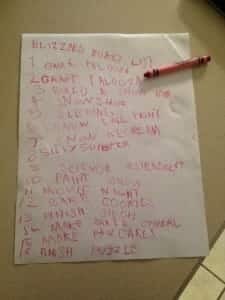 I love the blizzard bucket list! My son is really missing snow while we’re here in Peru. He feels cheated out! He would love a hike in the snow. There will be plenty of snowy winters for him, but Peru? A lifetime of memories! Great job, mama! So much fun! We also LOVE BrainPop. I’m seriously considering making it the spine of our grammar lessons. Jess, yes! I thought it was going to be more game-like when we signed on. It’s an amazing resource. I find myself using it all the time. Do you use the Jr or the regular version? I’m debating between the two when it comes to renewal. Thanks for stopping by my blog earlier. I enjoyed reading about your day and ended up reading a lot of older entires too. Reminded me a lot of my earlier days of homeschooling. Pretty sure my Mr 22 is highly gifted with a few added quirks for good luck – so a lot of common ground. And I laughed about the birthday party for Linda . When Mr 22 was 3 we had one for Spot , his stuffed dog complete with chocolate cake and dog biscuits! Thanks for reading. I love to hear that others can relate to some of this stuff I throw out into cyberland. I love how you said he has “a few added quirks for good luck” – boy can I relate to THAT 🙂 I love that you had a party for Spot, too. Poor Linda is under the weather today. She’s gone back to bed already. I *love* kids’ imaginations. Thanks for stopping by! Love your idea of a board game challenge! Games are such a great way to while away the winter hours.